indulge me while i take one laaaaast look at summer. the weather this past weekend was probably the last hint of summer that any of us on the east-coast will see for a while. it was so unusually warm and sunny for a day in october, that i got to dine al fresco in my backyard one last time. which i was so happy to do, since i barely got to enjoy summer this year. i was too busy trying to buy the house i finally moved into about a month ago. but thanks to my parents' hard work, i was kept in constant supply of the best of summers' foods: fresh, organic, home-garden-grown herbs, zucchini blossoms, chard and most of all…tomatoes. 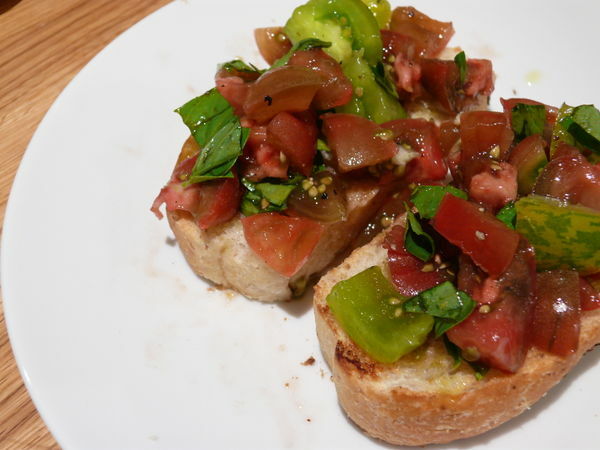 it takes seconds to top some fresh bread with tomatoes, basil, maldon salt and a worthy olive oil. and only a minute more to add cucumbers, olives, feta and a dressing of oil, red wine vinegar, oregano and lemon to make a greek-like salad. and with just a little more time and a couple more ingredients, a fulfilling savoury main dish is born. i wish i'd had known about this great and easy recipe earlier. i obeyed orangette's orders and made this tasty stuffed tomato dish before the tomato window closed. but it's time to move on to heartier fare! and hearty is a great way to describe this cheese and chutney sandwich. plain cheese & chuntney sandwiches are tasty on their own, but the richness of avocado, and the crunch and tartness of the pickled shallots add a great dimension to every bite. the sun-dried tomatoes add texture and of course, lots of flavour. i had the same idea in mind with this salad combination: buttery beans, tart olives and the crunch of fresh onions this time. lots going on in these two recipes. spread a layer of chutney on each slice of bread. fill with the remaining ingredients. toss arugula, beans and olives in a bowl. combine shallots, oil, vinegar, mustard and salt and pepper to taste. whisk well and add dressing to salad. note: have any fried chilis around? or any pickled banana peppers? a bite of either of those and a bite of the sandwich… (and repeat…) …perfect together!